caption: Weeew!!!! Let's take a bath! 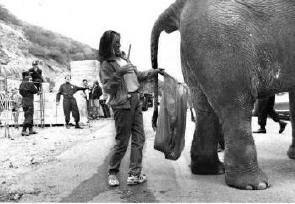 caption: And you thought your job stunk! caption: jack pot...what do i win? caption: having a crappy day? caption: Heftie its a glad bag! caption: UMM..... Did I see some fall out ??? caption: Tape Wprms hurt US! caption: ok i can see the head! oh no wait...... r elephants brown? caption: Not Gonna Get SIC-blaaaa! caption: What am I doing? caption: What do you mean comunity service???!!!??? This bag ain't going to hold it. No, really, I'll catch it. Last time I sign up for free admission to the zoo! The brochure didn't say anything about this! I guess you had Mexican last night, huh big fella? Smeone's always left holding the " Bag"
we're having some fun now!!! Must be a union job! #2 of the "World's Most Dangerous Jobs"
quit complainging about YOUR job! I'VE TOLD YOU ONCE ALREADY, YOU DID'NT HAVE YOUR WATCH ON !. All right now, you pump the tail and I'll catch what comes out. "Plop, plop, fizz ,fizz, oh what a relief it is!" The new way of luring out tape worms. Keep it clean - this is a family website!!!!!!!!!! !